With all that in mind, we are not afraid to declare that our official stance is… somewhere in the middle. 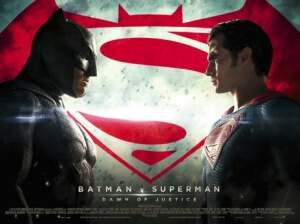 Certainly better than Man of Steel in more areas than one, but at the same time coming nowhere near the likes of The Dark Knight or some of the far better DC titles of the past, Batman v Superman neither has enough bad stuff for us to truly hate it, nor enough good stuff for us to say that it’s a work of art (which it isn’t, at all). We are at middle ground here, caught somewhere between loving it and hating it, but there is nothing wrong with that at all. After all, given some of the harsher reviews it has received so far, it’s only fair that at least one write-up keep a level-headed opinion about it. We start off during the controversial destruction-heavy climax of the previous film, where Bruce Wayne (Ben Affleck) races to his company building before it’s destroyed in the ensuing Superman-General Zod fight (a response to the much-criticised disregard for human life during that fight, perhaps? ), triggering a resounding distrust and hatred for the Last Son of Krypton. Speaking of whom, Clark Kent (Henry Cavill) is struggling to cope with the responsibilities that come with his heroic activities, facing the wrath of Holly Hunter’s Senator Finch after an international incident results in more loss of life, as well as maintain a relationship with reporter Lois Lane (Amy Adams). He and Wayne/Batman eventually cross paths and declare their mutual dislike of each other, but after a bit of goading from entrepreneurial madman Lex Luthor (Jesse Eisenberg) it would seem the fight is on, only for it to be revealed that Luthor’s planning his own means of destruction involving some discovered Kryptonite and the body of Zod. Oh, and if that weren’t enough, Wonder Woman (Gal Gadot) shows up in her first-ever big-screen role. As do Aquaman (Jason Momoa), The Flash (Ezra Miller) and Cyborg (Ray Fisher) in blink-and-you’ll-miss-‘em set-ups for the Justice League. And there’s a something about a boat in there, too. Yeah, you can probably guess the biggest problem with this movie: there’s just far too much going on at the same time, like a different strand of movies tied together on the same knot and left dangling without being properly straightened. It’s a mystery, then it’s a political thriller, then it’s a monster movie, and then it’s a platform to jump right into another movie, all before it even gets to the titular fight itself. It’s basically DC’s very own The Amazing Spider-Man 2 in terms of how crowded it is, except they can’t sell the rights back to Marvel if it underperforms. It all makes the film a little longer than it needs to be as well, at two-and-a-half hours long, which makes it a little more frustrating when you can clearly spot the scenes and plots that could have so easily been cut out to trim it down to a less-numbing running time. We won’t go into details about which scenes in particular, cos spoilers, but trust us, you’ll know them when you see them. However, those are honestly our biggest faults with the movie. We’re sure that there’s plenty more that we haven’t touched upon or even thought of, and we completely understand why anyone would outright hate this film as much as they did Man of Steel, but for our money we can name more things about this film that we liked more so than we could about the last film. For one, it’s (slightly) better-written: the hiring of Chris Terrio (Argo) to rewrite David S. Goyer’s script is a welcome one, as these characters and ideas are given a little more room to flex their muscles than Goyer allowed them to previously, giving them a few needed moments to actually feel a little more grounded and believable. Even Zack Snyder has improved his direction this time round, and even though the final product is as messy as it is, the action is much better laid out this time (the film has mostly gotten rid of that jerky shaky-cam so we can actually see things now), some scenes actually have a good amount of tension and suspense to them (a courtroom scene is up there with the director’s strongest moments), and it’s far less of a gruel to watch even at its bloated length. Affleck is definitely a strong Batman/Bruce Wayne combo, Cavill continues to do just fine as Superman, and Gadot manages to steal the entire show in her late entrance as the Amazonian warrior herself (hopefully her forthcoming solo film sets the bar high for the desperately-needed female superhero market), and when they’re all on-screen together at last it’s rather awesome to say the least. At the moment, though, we’re still a little hesitant about the inevitable Justice League movie, only because it is very likely to continue dividing the fan base as much as these films have done so far. To be fair, it’s understandable: Batman v Superman is NOT a great movie. Like we said, it’s messy, overlong and combining several movies all at once instead of being just the one it needs to be. However, there’s no reason to write it off completely, as we feel there are way more strengths about it than there were in Man of Steel (for one, hundreds of thousands of people don’t die in the climax this time) and we feel that, if it continues to step in the right direction, the DC Extended Universe could one day actually compete with Marvel once again. Batman v Superman: Dawn of Justice is far too much of a mess to truly be considered great, but at the same time the improvements it makes from Man of Steel as well as its own qualities are enough for us to declare it far from terrible.